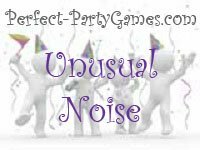 Summary: Unusual Noise i an Ice Breaker Game that involves making strange noises and creates lots of laughter. Have the group form a circle. The leader starts out by ‘throwing’ a sound to someone in the circle. This is done by pretending to hold a ball in your hands, and while throwing it to the other person, emitting an unusual sound. The person receives the sound by pretending to catch the sound ball with their hands and mimicking the noise they just heard. Then that participant throws a different sound to a different participant. Continue until everyone has had several turns throwing and catching sounds.